As spring ended in the village, I was left with a tough choice. Which sin made someone more worthy of death: embezzlement or kleptomania? The Shrouded Isle had turned me into a shrewd cult leader. 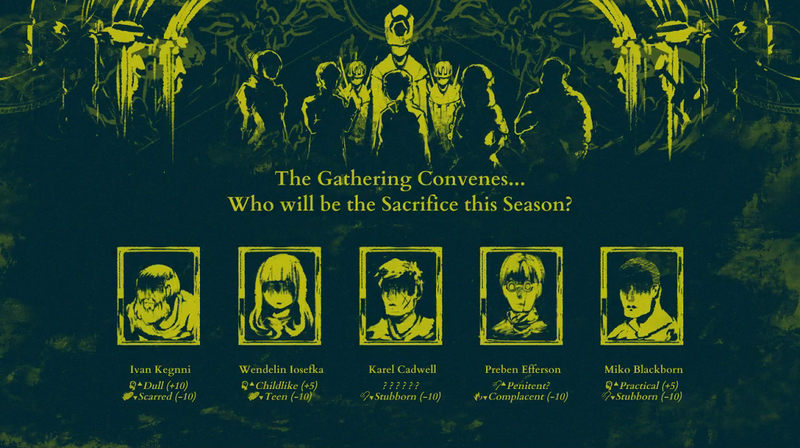 In The Shrouded Isle, released last Friday on PC, and Mac, you lead a small village whose residents all belong to a cult. The god they worship demands a sacrifice each season. As leader, you appoint a member of each of the village’s five major families to be your advisor each season. Each month, you assign three of these advisors to encourage the tenets of the society, such as ignorance, obedience or religious fervor. During the course of the season you’ll find discover traits that will raise these qualities faster; for instance, a particularly violent advisor will boost your obedience. You’ll also discover their sins, which is important, because at the end of the season, one of these people have to die. The presentation of the game enhances the mood. The illustrations evoke woodblock prints, and the chilling music is heavy on the foreboding cellos. I especially liked the incidental writing. Each time you mouse over a member of a family, you learn a small fact about them. One character, you learn, lost their tongue as child, while another fell in their youth and never quite recovered. It’s difficult to juggle everything you need to win in The Shrouded Isle, but I guess running a cult isn’t easy. Over the course of my playthrough, I grew pretty attached to my characters. When I found a particularly fervent or obedient advisor, I’d pick them again and again. When I uncovered a rebel, I delighted in sacrificing them. My attachment to these characters also managed to make my losses as satisfying as my wins. Sure, you may not have kept your village ignorant, but that means all the characters you’ve met over the course of the game have broken free. I’m still gunning on meeting our god, Chernobog, and I’m weirdly excited to feed him all the sinners he needs.